The Ancient Order of Hibernians is an Irish Catholic fraternal organization. Members must be Catholic and either born in Ireland or of Irish descent. Its largest membership is now in the United States, where it was founded in New York City in 1836. Division Meets Third Wednesday of the Month. The purpose of the Committee is to directly express the parish’s sympathy by offering support at the time of death of a family member. This Committee is comprised of volunteers from each of our 5 Parishes led by a coordinator and functions under the Parish Office. This service is extended to all members of the community in the event of the death of a family member. Routinely, the parish secretary notifies the coordinator by telephone of a death in the parish and provides the deceased’s name, address, phone number, next of kin, and funeral arrangements if known. The coordinator makes direct contact with the family, preferably in person, as soon as possible. Committee members visit the bereaved family members to offer support and inquire as to the desire of needs and to assist them in the planning of the services offered by the Parish. Services offered: Food, Medications and Utilities, Individual, Children & Family Counseling, Military & Veteran Support, Our Kids: A Parent Education and Awareness Program, Victim Services. Founded by Fr. Michael J. McGivney, assistant pastor of St. Mary’s Church in New Haven Connecticut on March 29, 1882. State Legislature officially chartered the Knights of Columbus as a fraternal benefit society on that date. The Order is still true to its founding principles of charity, unity and fraternity. This group welcomes all men, married or single, to join us each month on the 2nd Wednesday of every month at Immaculate Concpetion Church&apos;s Rectory Meeting Room. “I love those who love me, and those who seek me diligently find me.” (Proverbs 8:17). Each year, many adults are called to join the Catholic faith. How does someone join the Catholic Church? Through a process called the RCIA. Rite of Christian Initiation of Adults (RCIA) is the process in which adults become full, participating members of the Catholic Church. Participants, known as catechumens go through a process of studying the Gospel, nurturing their relationship with God, becoming familiar with the Catholic teachings and practices, professing their faith in Jesus and the Church, and receiving the sacraments of initiation: Baptism, Communion, and Confirmation. 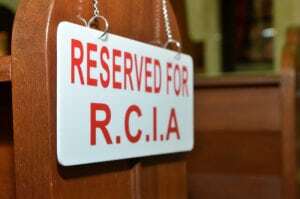 Let’s take a closer look at the process of RCIA and answer some FAQs about this important journey. Someone who is of another faith and wishes to convert to Catholicism. Someone who was baptized in the Catholic Church, but never received the sacraments of First Holy Communion and Confirmation If you are interested in becoming a Catholic or seeking to grow in the knowledge of the faith please contact the Parish Office for further information 585-593-4834. Spirituality may refer to almost any kind of meaningful activity, especially a "search for the sacred." We are focused, as Catholic Women, on coming together in "search for the sacred" by forming a study base group on a different, more meaningful level, revealing the hidden treasures of the Catholic Faith and delve deeper into scripture. It a time of social gathering and growth. Please come and join us! Members furnish linens, vestments and Eucharist hosts for the Holy Sacrifice of the Mass. Volunteers launder linens and assist in dry cleaning necessary to maintain vestments and altar linens.